Saint Jean de Brebeuf and Joseph Chiwatenhwa were men from very different backgrounds. Brebeuf was a Priest in the Society of Jesus (the Jesuits). He received his call from God while praying in the marble cathedral of Paris and he was inspired to join the Society of Jesus in their mission of teaching Christian doctrine at the Royal courts, in institutes of higher learning, and even on the street corners to the poorest of the faithful. Chiwatenhwa, of the Huron-Wendat nation, was a married man with two children and a warrior raised in the traditions of his people. After meeting Brebeuf at a seasonal celebration in his village and listening to him speak of his love for Jesus, Chiwatenhwa turned to God and was baptized under the name of Joseph, in honour of Saint Joseph, the earthly father of Jesus Christ. Brebeuf lead Chiwatenhwa in the Spiritual Exercises of Saint Ignatius of Loyola, and Chiwatenhwa shared his knowledge of the land with Brebeuf. Both Brebeuf and Chiwatenhwa were devoted to the cross and found grace in the beautiful landscapes and tall trees of the region that became Brebeuf’s cathedral. 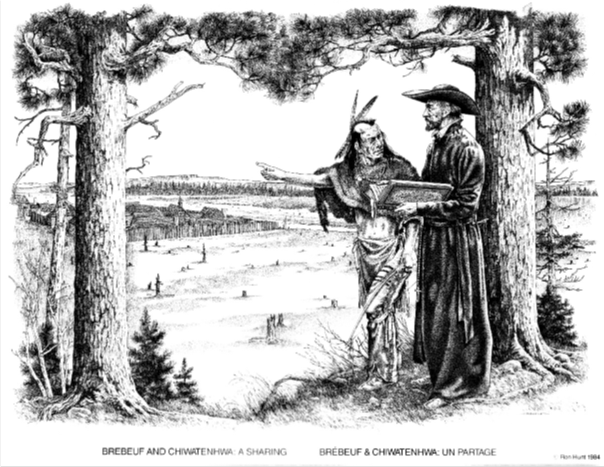 Both men died at the hands of the Iroquois– Brebeuf a Martyr, and Chiwatenhwa a victim of war. Their friendship, rooted in their love for God, crossed cultures, faiths, and adversity and stands as a timeless tribute to the Catholic Church in Canada – a church expanding and working in a vast and beautiful land, still encountering new cultural communities, and still carrying the hopes of Brebeuf and Chiwatenhwa. 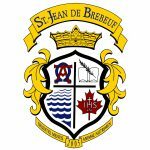 St. Jean de Brebeuf was canonized in 1930. He is a secondary Patron of Canada and his feast day is September 26th.